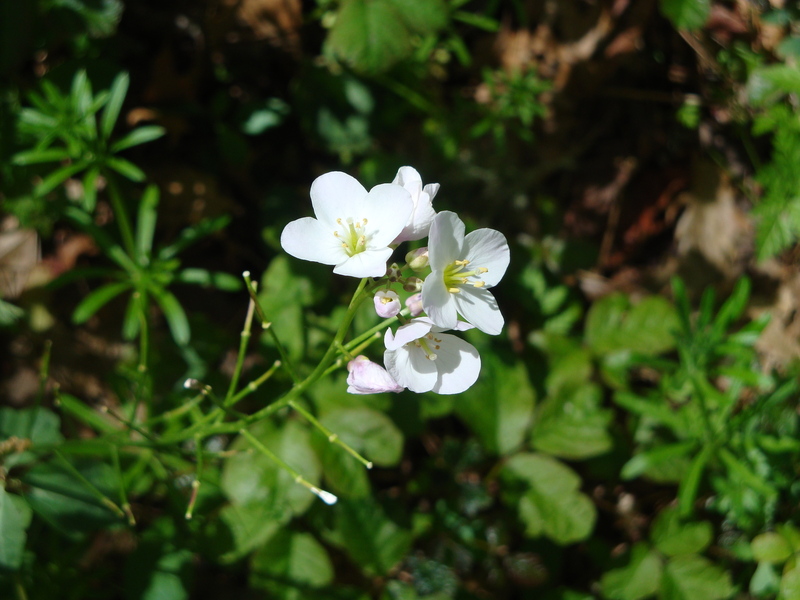 Cardamine californica, otherwise known as toothwort, milkmaids, or bittercress (which is what “cardamine” means), is a beautiful early season wildflower that has been quite prominent in our area so far this year. While most field guides will tell you that it blooms from February, or maybe January, through May, early season rains had it blooming in abundance this season as early as mid-December. We saw it blooming in large quantities along the Pine Ridge Trail when we were doing maintenance there on December 18th. This shade-loving west coast native can grow to over two-feet tall and produces bunches of flowers that range from pure white to pale pink. A member of the mustard family, its early emergence is made possible by the energy stored in a robust underground tuber. Good places to see it include, not only the opening miles of Big Sur’s Pine Ridge Trail and Cachagua’s Blue Rock Ridge, but also Garland Regional Park (try the trails between the Mesa and Garzas Creek) and pretty much any damp coastal canyon. This entry was posted on Friday, January 13th, 2012 at 9:48 pm and is filed under Big Sur. You can follow any responses to this entry through the RSS 2.0 feed. You can leave a response, or trackback from your own site.